This Pelican 2640CB Heads-Up Headlamp is a powerful, halogen/LED combo, hands-free light for any task, big or small. Flip the switch up and you've got three bright and efficient LEDs that are perfect for close-up work and tasks that require intense white light. For jobs that demand a powerful beam, flip the switch down for the halogen mode. This lamp cuts through thick smoke and dust. The body is tough ABS resin that's corrosion proof and resistant to extreme temperatures. The 90° pivoting head allows you to aim light right where you need it. The lightweight battery pack houses four AA alkaline cells. The 2640CB comes with a rubber strap for hard hat use and an adjustable cloth strap for your bare head. Flip the switch up and you've got three LEDs, or flip the switch down for halogen mode. The lightweight battery pack houses four AA alkaline cells behind your head on the strap. UL Listed 4S67/E184884 Class l; Div. 2; Gp.A,B,C, D T3. 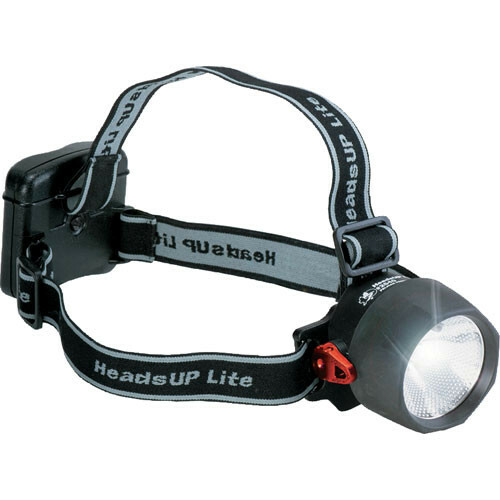 Box Dimensions (LxWxH) 8.2 x 7.3 x 3.3"
2640CB Heads-Up Headlamp is rated 3.8 out of 5 by 5. Rated 5 out of 5 by Anonymous from Absolutely the best! I have used this head lamp for the last three years for hunting, ice fishing and whenever I need illumination. Having both hands free and ample light is exactly what I need! A lifetime guarantee from the manufacturer is the icing on the cake. I am purchasing additional headlamps for gifts and also for resale in our business. Rated 5 out of 5 by Anonymous from Extremely good product Durable headlamp used by a wildland firefighter for 6 years now. LED's are battery savers and as bright as the halogen. Best feature is you can unplug the power cord and prevent accidentally turning on the lamp while carrying in your pack and not in use. Would recommend to anyone. The description mentions 4 alkaline batteries. Can it take rechargeables? Yes, rechargeable batteries would work just fine.